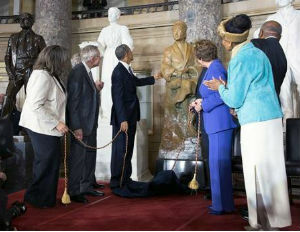 President Obama gathered with many around the U.S. Capitol yesterday (February 27) to honor civil rights activist, Rosa Parks, as the nation’s capital unveiled a statue in her honor. While many were in attendance, including Parks’ family and political officials, the President stood up and “praised Parks as an enduring reminder of what true leadership requires,â€ says the Huffington Post. But of the many people who came together to remember and honor such a remarkable woman as three-year-old Terrell Anderson Jr., one of the activist’s youngest living relatives. 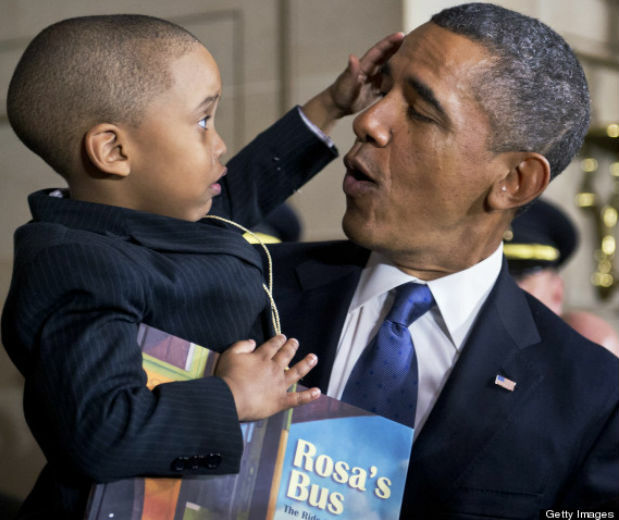 Delighted by young Terrell, President Obama picked up the child as he began to play with POTUS’s hair.